There’s nothing that breaks up the beauty and unity of your home’s gorgeous landscape design in Denver, CO like a stubborn old stump stabbing through your lawn and aside from interrupting the look of your landscaping, stubborn stumps which are left standing on residential property can pose a number of problems including an increased likelihood of pest infestation, a decrease in the color and healthiness of your surrounding plant life, and an inconvenience for your family every time lawn mowing and care are being performed. Between all these different factors, there’s plenty of reasons to seek the help of our professional team of arborists to perform stump removal in Denver, CO for your home. 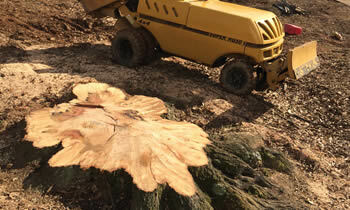 Why Choose Chop Chop Tree for Stump Removal in Denver, CO? When it comes to services like stump grinding and stump removal in Denver, CO it’s easy for an inexperienced, undertrained company to provide you with service that not only fails to remove the entire stump but actually damages your surrounding landscape and potentially your home’s siding, wiring, or plumbing in the process. The Chop Chop Tree team of professional Denver stump removal specialists, on the other hand, are specially trained and certified to safely, thoroughly, and efficiently perform stump removal in Denver, CO using equipment and techniques which are guaranteed to get the job done right without causing any damage to the surrounding area in the process. If you’re looking to rid your yard of a frustrating tree stump, then the team of specialized Denver stump removal professionals here at Chop Chop Tree are just what you need. To get started with yours and to learn about all the equipment, hours, expenses, and specifications of your particular stump removal Denver, CO service take a moment to call our friendly and knowledgeable representatives at (720) 307-3661 to schedule a free consultation, assessment, and estimate. All this information is completely free and completely free from obligation so don’t wait call (720) 307-3661 today!